Now that the Chicago Bears have traded Jordan Howard to the Philadelphia Eagles, more attention will be paid to what the team does at their running back position as the offseason continues. The team has already made a free agency move at the position, signing Mike Davis to a contract, and the team also has Tarik Cohen in the fold for the coming year. Aside from those players, which college players could the Bears target in the later rounds of the NFL Draft? With no first or second round pick, and with no sixth round pick, the Bears only have a few bites at the apple, but these five players could be on their radar when the team heads to Nashville next month. G.M. Ryan Pace has made some big moves for players out of small schools, and Hills could be the next player in that line. He rushed for 1,714 yards in 11 games, and had 28 receptions for 193 yards. The 6-foot-2 back is a bruiser and has some good lateral quickness, so if the Bears are looking for a replacement for Howard with slightly better hands, Hills could be the guy. 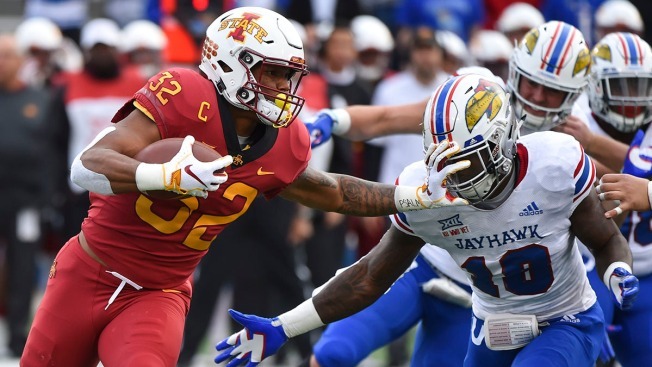 A slow time in the 40 could impact Montgomery’s draft stock, but he is a strong pass catcher, with 22 catches for 157 yards last year, and had 1,216 yards and 13 touchdowns in his final season with the Cyclones. A late-round option, Pollard averaged 7.1 yards per carry last season for the Tigers, and he racked up 39 passes for 458 yards in his final collegiate season. At 5-foot-11 and 210 pounds, Pollard looks to be a dynamic threat in multiple areas on the offense, and could be a player for Bears fans to keep an eye on as the later rounds of the draft get underway. Scott went through some injury issues in his final season with the Spartans, but scouting reports rave about his ability to make tacklers miss and his ability to catch passes out of the backfield. At 6-feet tall and 227 pounds, he’s also really difficult to tackle in the open field, and that could be a great change of pace from Tarik Cohen out of the backfield. The Bears could also look to Notre Dame for help at running back, as Williams rushed for nearly 1,000 yards and scored 13 all-purpose touchdowns in his senior season with the Fighting Irish. He had a good showing at the Senior Bowl and only has one year of experience as the featured back, but he could be a good complementary piece in Matt Nagy’s system.